The idea of “cutting cable” has been spreading across the country. This year it has been reported that five million homes have stopped paying for cable and satellite television subscriptions. Instead they’ve opted to return to an often underappreciated source for TV: the TV antenna. How Does a TV Antenna Work? A TV antenna is basically a specially shaped bunch of wires that pick up the signals broadcast by television networks. Your TV requires an antenna in order to pick up stations broadcast by television stations. Your TV antenna receives the signal and converts that signal into audio and video signals that can be used by the TV to display whatever program you are watching. Antennas will only receive local stations and those broadcast by major networks (like ABC, NBC, Fox and CBS). The number of stations available depends on where you live. However, over 80 percent of Americans live where they can pick up at least 5 stations, since the major networks transmit in every major city across the country. To pick up more stations, you can use outdoor antennas like the Vortex HD, which can recieve signals from up to 125 miles away. Why Use A TV Antenna? It used to be that over-the-air TV was analog, but now TV stations are all digital, this switch made it so HD channels can now be broadcast over the air. Although it might seem counter-intuitive, an HD antenna actually provides slightly better image quality than cable TV and satellite. This is because these providers compress the signal (even HD signals) in order to efficiently transmit massive amounts of data. Local stations send out a completely uncompressed signal, meaning that you get the highest quality video and sound. The main reason people used cable was because they wanted more than 5 channels to pick from. With streaming services like Netflix, Hulu, Amazon, and more providing inexpensive streaming services with tons of different TV shows and movies to choose from, cable seems obsolete. Especially since Netflix costs less than $10 per month and most cable companies charge upwards of $50. A TV antenna allows users to supplement their streaming services with live local stations for free. One of the main turnoffs of cutting cable and using an antenna has been the fact that antennas can be ugly at times. But things are improving. Just as HDTVs are getting slimmer and more stylish, antennas are becoming thinner and more attractive too. Here at Sewell we’ve just released the new Ghost Flat Antenna, which is barely larger than a sheet of paper. It’s thin and light enough that you can easily hang or hide it anywhere. Put it up in a window to get the best possible reception, or hide it behind a picture frame so that no one sees it. 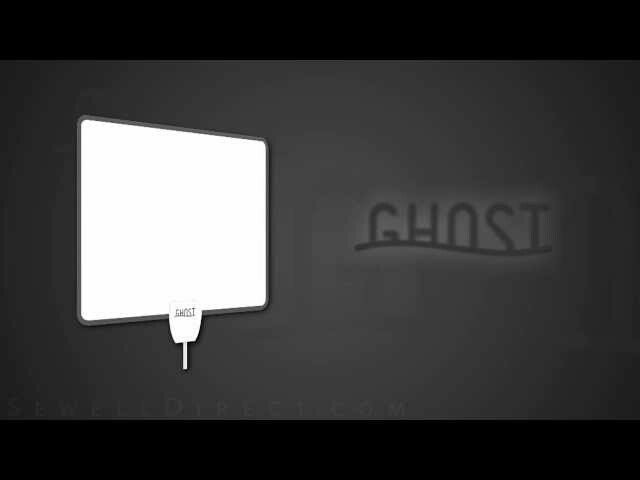 With the ghost antenna you can get free HD television without sacrificing your sense of style.